We are always on the hunt for a new ankle boot trend because, to put it frankly, boots are the most hard-wearing items in our wardrobes. They are comfortable, relevant no matter the season, and can easily be dressed up or down for the various occasions that flood our schedule. So are you ready for the latest and greatest in the world of ankle boots? Enter cone heels. Initially, the oddly shaped heel detail might seem minor, but when the style is actually on your foot, it creates a shape that is extremely fashion-forward. We love this ankle boot trend for many reasons. One is that it is the perfect mixture of a block heel and a stiletto. You are getting the support of a block heel while simultaneously receiving the sleek look of a skinny stiletto. The second is that the heel shape is downright striking—sculptural heels of every kind (like this absurdly popular Mango creation) are certainly having a moment. While the new trend might take some getting used to at first, we are confident that after taking a look at some of our favourite pairs, you'll be quickly convinced. 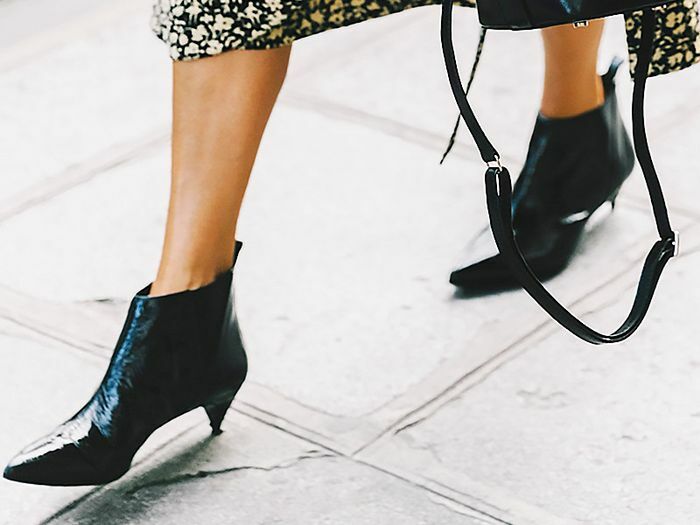 Keep reading to shop our edit of the best cone-heel ankle boots. A combination of two of the season's hottest trends (white boots and cone heels)? Sign us up. These buckles couldn't be more edgy if they tried. This style would look great with a pair of skinny jeans. The name of these boots makes so much sense. The perfect duo of a cone heel and kitten heel. These boots are a classic option. For more boot trends, see our guide to the best ankle boots around right now.